NEW ORLEANS – The fans have spoken. They want Fred Kerley and Raevyn Rogers to win The Bowerman. Kerley and Rogers were crowned champions of the 2017 Fan Vote on Monday by the U.S. Track & Field and Cross Country Coaches Association (USTFCCCA). More than 39,000 votes were tallied between June 22 and June 30 for the women’s finalists and nearly 35,000 were bestowed upon the men’s finalists. Kerley is the second male athlete from Texas A&M to win the Fan Vote as he joins 2014 The Bowerman winner Deon Lendore in that regard. Rogers is the first Oregon woman to win the Fan Vote since former The Bowerman winner Laura Roesler in 2014. Throughout most of the proceedings, it appeared as if former Tennessee standout Christian Coleman would run away with the Men’s Fan Vote – just like he did the NCAA short-sprint titles during the indoor and outdoor seasons. Coleman owned 45.2 percent of the vote as of last Wednesday compared to just 33.3 percent for Kerley and 21.5 percent for Lindon Victor. Then votes poured in for Kerley and closed Coleman’s gap to 4.5 percent on Thursday. When voting closed last Friday, Kerley shot ahead of Coleman. Kerley ended up with 40.8 percent of the vote, while Coleman had 38.8 and Victor finished third with 20.4. The Women’s Fan Vote was incredibly close, just like it has been in previous years. While Rogers led early, there was little to no separation between her and the other two – Arizona State’s Maggie Ewen and Georgia’s Keturah Orji. Then just like last year, a late surge pushed Orji ahead. Orji won the Fan Vote last year and was looking to become the first person in The Bowerman history to win consecutive Fan Votes. Rogers weathered the storm and her fans proved they were tougher together. The Oregon star finished with 35.5 percent of the vote compared to 33.0 for Orji and 31.5 for Ewen. Kerley and Rogers will both receive an all-important first-place vote, giving them an official early lead on Coleman and Victor as well as Orji and Ewen, respectively. 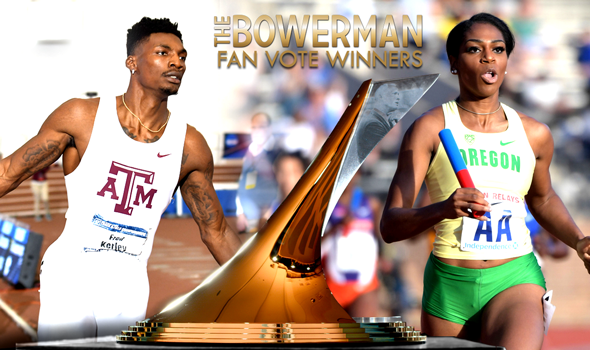 The Fan Vote is just one component of the formula used to decide the winners of The Bowerman, collegiate track & field’s highest honor. Four men who won the Fan Vote eventually won The Bowerman: Ngoni Makusha in 2011, Cam Levins in 2012, Lendore in 2014 and Jarrion Lawson in 2016. The same could be said for three women: Jenny Barringer in 2009, Jessica Beard in 2011 and Roesler in 2014. This year’s winners of The Bowerman will be announced on Friday, December 15, at the annual USTFCCCA Convention in Phoenix, Arizona. Convention will be held at the JW Marriott Desert Ridge Resort and Spa.